A co-worker recently mentioned that Meghan resembles the little girl in the famous Renoir “On the Terrace” painting. Now that I look at them side by side, I can kinda see what he’s saying. And to me, she really is a masterpiece! Christmas came a little early this year. It wasn’t wrapped, and there were no tags. But my daughter’s closet is full of winter clothes and beautiful dresses for the spring and summer seasons. Her bookshelf is teeming with new titles, including some bearing the coveted Caldecott seal. All this and Thanksgiving has yet to roll around. Sure a few corners of these books are frayed or missing a page, and yes, a few outfits are likely a shade lighter than they were when on the rack, but that’s the beauty of hand-me-downs. They already have a story. 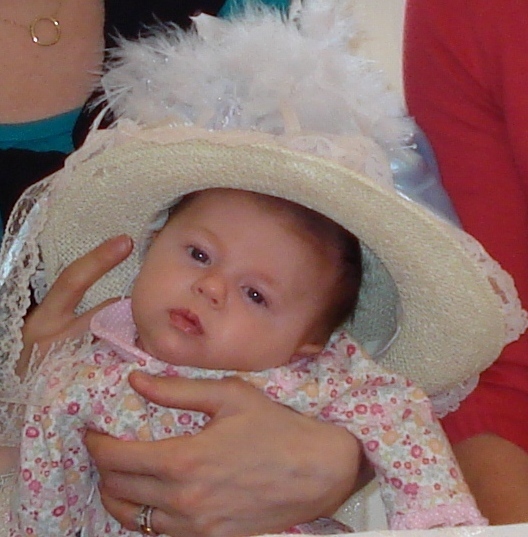 Costumes: By my elder sister, Lori, who fell in love with outfits for her own baby girl, experienced timeless memories with her in them and then carefully packed them away for my little girl. Script work: By another of my elder sisters, MB. I certainly did enjoy sifting through books with you last night as you recounted which ones were your little boy’s favorites so I could flag them for mine (yes, we’re having a boy)! And now, as I begin to field questions about what Baby Blue wants for Christmas, I am at a loss. She has so much already. If only that were the case for everyone. And so I make mention of a worthy cause that would more likely benefit from some Christmas gift giving–the Lighthouse of Oakland County–another Michigan gem. Every year this organization provides holiday meals, groceries and meal baskets for needy families. Lighthouse also runs a program whereby individuals can “adopt” a needy family and fulfill its Christmas list. I’m always taken aback when the Christmas list for the family we adopt each year arrives and the eight-year-old wants only socks or underwear and his 10-year-old brother desires only a winter coat. You can bet, we search for the warmest coat we can find! If you are looking for a worthwhile cause this holiday season, Lighthouse of Oakland County certainly fits the bill.